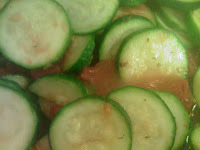 The B Charmer Journal: Day 11 Pickle-ini Anyone?? Whew...today was full, but nice. Bible School this morning was a taste of what is to be very soon. Singing and dancing with children all day! School will be back in session quite shortly, and once again I will be making music with the kiddos. I am already looking at Christmas Programs! Any suggestions?? Our dinner entertainment was supplied tonight by none other than Jackson Douglas and the tales of the 3 year old chronicles. He insisted tonight that we were eating hot pickles with tomatoes. No matter my explanation that the pickles were really zucchinis, he was certain I was wrong. After much debate, we settled on pickle-ini. He would only eat them under their new given name. I complied for the sake of nutrition --and for all the pickle-inis across the land on family tables tonight.